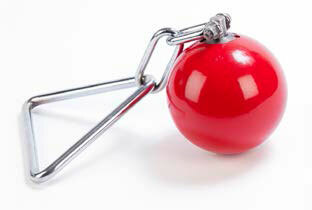 Turned Steel throwing weight gives smaller diameter and has high quality powder coated finish. Handle uses special welding process to eliminate Possibility of handle breaking on impact. Swivels use same “BLACK ICE” designed bearings as used on Cantabrian hammers to help give improved spin of weight. Heavy duty link between swivel and handle avoids kinking or binding and allows full feel and control of ball through handle. Price displayed will change as your selection changes. THESE ARE CLOSEOUT - PLEASE CONTACT US FOR AVAILABILITY. Type 12lb. 20lb. 25lb. 35lb. 56lb.